Note that . It follows, from Equation (9.35), that if the mass has the Jacobi integral and lies on the surface specified in Equation (9.60), then it must have zero velocity. Hence, such a surface is termed a zero-velocity surface. The zero-velocity surfaces are important because they form the boundary of regions from which the mass is dynamically excluded; that is, regions where . Generally speaking, the regions from which is excluded grow in area as increases, and vice versa. Figure: Zero-velocity surface , where , calculated for . Mass is excluded from the black region. Figure: Zero-velocity surface , where , calculated for . Mass is excluded from the back region. 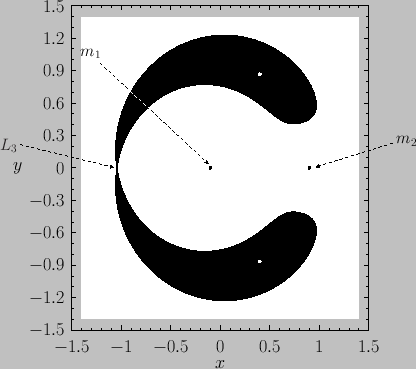 Figure: Zero-velocity surface , where , calculated for . Mass is excluded from the black regions. Figures 9.7 through 9.11 show the intersection of the zero-velocity surface with the - plane for various different values of , and illustrate how the region from which is dynamically excluded--which we shall term the excluded region--evolves as the value of is varied. Of course, any point not in the excluded region is in the so-called allowed region. 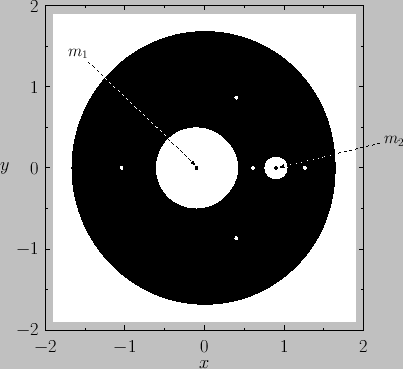 For , the allowed region consists of two separate oval regions centered on and , respectively, plus an outer region that lies beyond a large circle centered on the origin. All three allowed regions are separated from one another by an excluded region. (See Figure 9.7.) 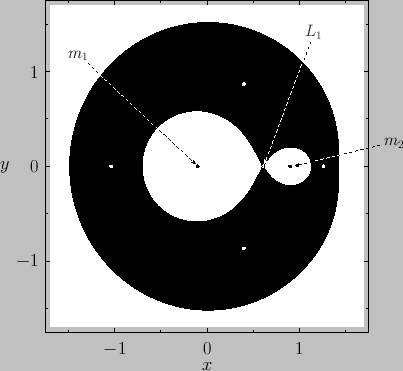 When , the two inner allowed regions merge at the point. (See Figure 9.8.) 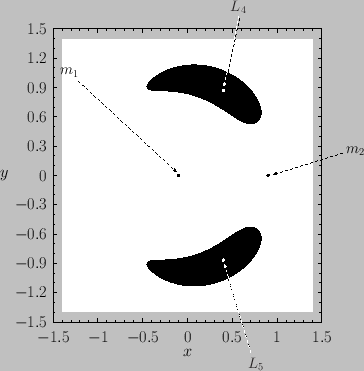 When , the inner and outer allowed regions merge at the point, forming a horseshoe-like excluded region. (See Figure 9.9.) When , the excluded region splits in two at the point. 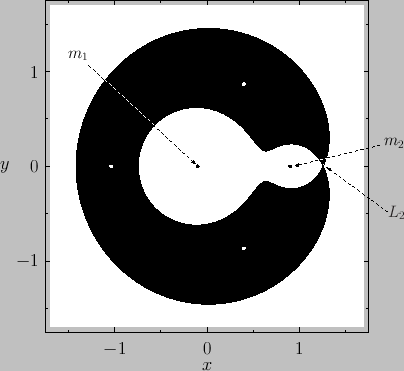 (See Figure 9.10.) For , the two excluded regions are localized about the and points. (See Figure 9.11.) Finally, for , there is no excluded region. Figure: Zero-velocity surfaces and Lagrange points calculated for . 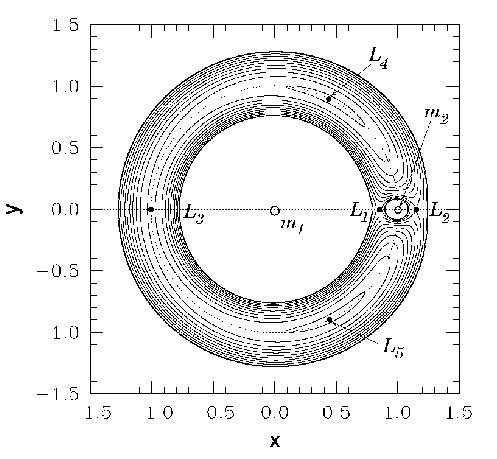 Figure 9.12 shows the zero-velocity surfaces and Lagrange points calculated for the case . It can be seen that, at very small values of , the and Lagrange points are almost equidistant from mass . Furthermore, mass , and the , , and Lagrange points all lie approximately on a unit circle, centered on mass . It follows that, when is small, the Lagrange points , and all share the orbit of mass about (in the inertial frame) with being directly opposite , (by convention) ahead of , and behind.